Ever since James Pimm first mixed a jug of this astonishing tipple in 1840, Pimm’s has existed to politely but firmly insist that there are more important things to do than writing “to do” lists like catching up with good friends. Enjoy a deliciously British Pimm’s® and Lemonade wherever you are: perfectly mixed every time. Best served chilled, or in a glass with ice, orange slices, strawberries, cucumber and a mint, perfectly portable for picnics. Delicious, ready-to-drink Pimm's & lemonade perfectly mixed with lemonade. 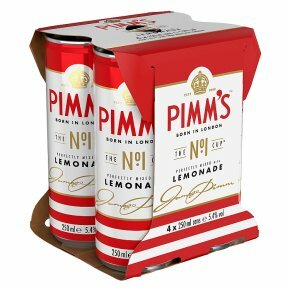 Pimm's is a Royal Warrant Holder. Complex fruity notes of bitter sweet caramelised orange with a fresh citrus & herbal finish. Pimm's No.1 is a gin based spirit mixed with orange liqueur and a secret blend of herbs and spices. The quintisentially British Pimm's No.1 Cup is perfectly portable for every picnic occasion. Ever since James Pimm first mixed a jug of this astonishing tipple in 1840, Pimm's has existed to politely but firmly insist that there are more important things to do than writing ?to do? lists like catching up with good friends. Enjoy a deliciously British Pimm's® and Lemonade wherever you are: perfectly mixed every time. Best served chilled, or in a glass with ice, orange slices, strawberries, cucumber and a mint - perfectly portable for picnics. Best served chilled, or in a glass with ice, lemon slices, strawberries, cucumber and mint.